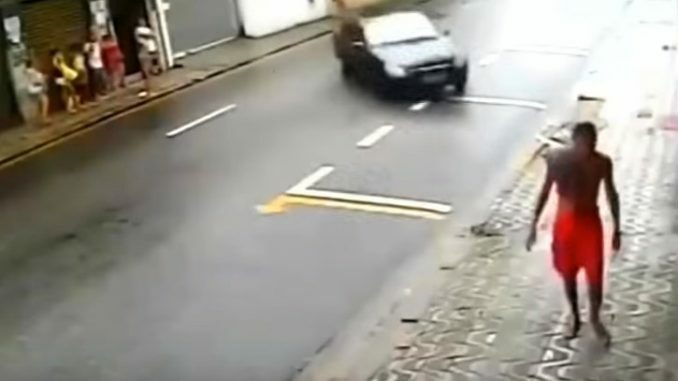 A man had a lucky escape when he unwittingly stumbled away from the path of a runaway car that was hurtling towards him from behind. The man stumbled sideways at just the right moment for the car to avoid him. The lucky pedestrian must have built up some good karma beforehand. The internet is no stranger to gasping over near-death experiences, but this one is something spectacular. CCTV captured the man as he strolled down the street, slightly stumbling. Little did he know his causal pace was going to save his life. As the out-of-control car enters the shot, it appears to be all over for the pedestrian who escapes the crash by mere inches. There’s no denying the man’s shock when he realizes what could have been. Visibly shaken with hands on head, he runs across the street to (we assume) contemplate the fragility of life.